Arsenal, as all true Gunners know, were originally named Dial Square, taking the name from one of the workshops at Royal Arsenal which had a large square sundial on its gates. However this page isn’t about the history of the team as such, more the badge and Arsenal have had a few through the years for various reasons. In fact Arsenal have more than anyone always been at the forefront of “trademark” issues surrounding their badge which is why we wont show too many images on here as they have been known to issue “cease and desist” notices to websites in the past who have used their crest !! 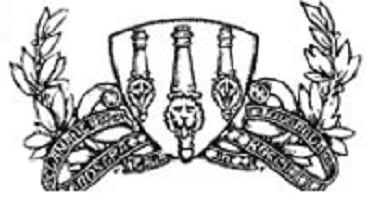 Anyway, Arsenals (or Royal Arsenal as they were then known) first crest was unveiled in 1888, and featured a view of three cannons from above, pointing northwards. These were obviously a reference to the military influence in Woolwich but were also similar to the coat of arms of the Borough of Woolwich. The cannon theme has developed through the years and has to a certain degree remained prominent on the Gunners different crests through their history, coming very much to the fore in the new design. This is the badge that most die hard Gunners recognise as the most important one in their history as it had been around since the late 1940’s. "...my mind seeks an apt quotation with which to close this season which has been such a glorious one for Tom Whittaker, Joe Mercer and all connected with The Gunners. Shall we turn for once to Latin? 'Victoria Concordia Crescit'. Translation: 'Victory grows out of harmony.'" Only a couple of seasons after that quote Arsenal did indeed release a new crest incorporating that motto, mention of the programme editors notes were made in the 1949-50 handbook where it said the club had been impressed by the motto and it had now been officially adopted by the Club. The new crest also featured 'Arsenal' in a gothic style typeface, the westward facing cannon, the Borough of Islington's coat of arms and ermine. And so the badge remained untouched save for minor changes through to the 2002 season when the club decided to “clean up” the design for commercial reasons, with a solid yellow replacing the different tones of gold and Victoria Concordia Crescit written in a different typeface. 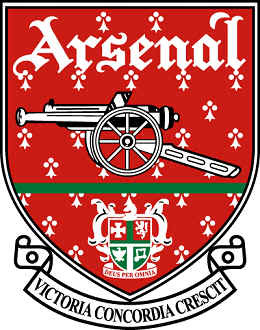 The underlying reason behind this was of course trademark issues, because of the numerous revisions of the original crest through the years and the fact that it incorporated many separate elements Arsenal had been unable to copyright it fully, the only legal way being to fundamentally change the design, however this simple “clean up” didn’t meet the copyright criteria hence not long after the current design was introduced. This drastic change of course infuriated the majority of fans who felt it was a betrayal of their heritage and a “sell out” to commercialism. However the club was adamant that the reason behind the change was that it had always been one of the Club's primary objectives to embrace the future and move forward. At that time they had a new stadium planned and the team was enjoying success on both the domestic and European front, they believed that it was the ideal time to introduce a new crest. Funnily enough the new design also offered Arsenal an opportunity to put in place a full and comprehensive legal protection of their badge. The new distinctive crest, because of its more modern look with curved lines and a simplified styling was now fundamentally different to the old one and as such was copyrightable. So there we have it, a potted history of the history of Arsenal Football Clubs badge, I hope its enlightened some of you and if I have got anything wrong please don’t just shout at me, drop me a mail and let me know !